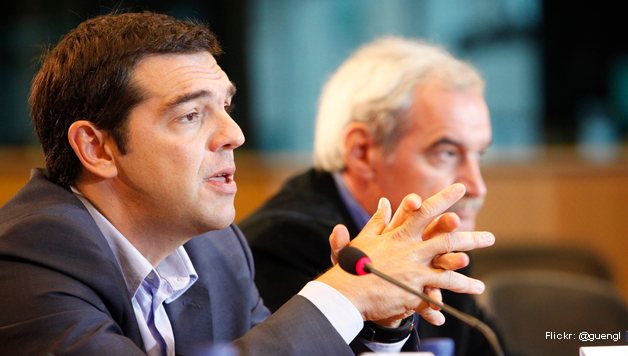 How do you view the deal between the EU and the Syriza government? We think it is a clear step backwards compared to what Syriza and Alexis Tsipras said before the elections. The first major issue is the debt. The agreement, signed by the government, says that the Greek government (i.e. the working people) will pay the whole amount of the debt (about 320 billion euros, i.e. over 170% of the GDP). Before the elections, Syriza said that the debt must be severely reduced through an international conference like the one that took place in 1953 and reduced Germany`s external debt. The second important issue is that the new government agreed that all the policies that will be implemented in the course of the next four months will have to be accepted and agreed to by the Troika (EU, ECB and IMF) which from now on will not be called “Troika” but the “Institutions”. Moreover the government commits itself, through the agreement, not to apply any policies that remove previous memorandum laws (i.e. the severe austerity laws). This means that the government will be under the continuous blackmail of the Troika and that the “programme of Salonica” (the immediate measures for the poorest parts of society that were presented to and agreed upon at a Syriza meeting in Salonica in September, 2014) is under question. The only positive point of the agreement is that the austerity measures that were agreed upon between the previous government and the Troika in autumn of last last year will not go ahead. Was there an alternative for Tsipras and Varoufakis other than to agree to the pressure of Schäuble and Co.? Yes there was an alternative; yes there was a different choice! The great majority of the Greek population was in favour of taking a “hard line”. That is why mass demonstrations were organized all over the country, even in small islands, in favor of the government and against the blackmail of the Troika and especially the German government. In polls, up to 70-80% of Greeks supported the Greek government in this “battle”. Xekinima (CWI in Greece), alongside other forces and even some Syriza MPs, proposed that Tsipras should turn to the Greek people and call for a referendum on the dilemma: “Euro and austerity or anti-austerity, pro-working class policies and the drachma?”. We strongly believe that if this question was posed the great majority of Greek workers and poor would have chosen to break with the euro. Of course, at the same time, we explained that the return to drachma would not, in itself, provide solutions to the crisis of Greek capitalism and socialist policies should be followed immediately to put the economy on a growth path and in the service of working people. How do people view these developments? Support for the government rose strongly after the elections, but will this change now? A big part of Greek society still supports the government because they compare it to the previous government of New Democracy/PASOK, one of the most hated, repressive and anti-working class governments in recent history. People are a bit relieved that there are no new austerity measures on the agenda! At the same time, it is clear (especially to the most radicalised layers) that the government is retreating massively under the pressure of the German, European and Greek ruling classes. It is clear that the government will not implement the immediate measures that were promised before the election, and they are trying to compromise with the class enemy. So big parts of society are confused and partially disappointed and this is clearly seen in the absence of mass participation for recent demonstrations. What would you propose as a plan for the government and the Greek left? The government should immediately take measures against the “humanitarian crisis”, the deep and mass poverty in which the majority is living. It should also go ahead, as was promised, with the return of collective agreements, the rise of the minimum wage to around 670 euros (take home, after subtracting social insurance payments and taxes from 751 gross) per month and abolish the heavy “house tax” on working class families who cannot pay it and are in danger of losing their homes. Such measures, though basic, will meet the enthusiastic support of Greek society. At the same time, Tsipras should identify and explain with whom the real responsibility for the debt lies (bankers, capitalists, the Greek, and the whole of the German and European ruling class) in order to justify an immediate stop to the payments. Then they should carry out socialist policies, nationalization of the banks and the commending highs of economy, under social and workers’ control and management and mass public investment etc., to plan the economy and put it on the path of growth. The economy should be “protected” from profiteering and the sabotage of Greek and European capital through capital controls and the control of the external trade. It is clear that Tsipras is not choosing this path. That is why the pressure from below, from the working class and other movements, is crucial. The Left forces that understand this perspective and do not agree with the ultra-left sectarian approach of KKE (Greek communist party) and ANTARSYA (‘anti-capitalist radical left’) have crucial and historical tasks. On the one hand, they have to organize the mass movement in order to put pressure upon the government. On the other hand, they have to come together, discuss, coordinate and explain the need for socialist policies to the broader masses, in order to start building a mass revolutionary-socialist political alternative.